The Dexway method uses student participation to recreat real-life situations organized in a learning environment that combines multimedia content and live interaction with native speakers and other learners. Students develop language skills naturally through structured lessons that allow progressive and flexible learning at the pace of the students while they learn grammar rules, lexical, and phonetic concepts through practice. Before starting the course, the student will complete a placement test that will position them in a level suited to their language skills. This online assessment is based on the guidelines of the CEFR and indicates what course level is most appropriate for the student. The Dexway courses, in all forms, are composed of educational video-based lessons and interactive exercises for a fun structured learning experience using real-life situations in a highly intuitive multimedia environment and specifically developed for language training. Dexway utilizes the most complete and reliable pronunciation evaluation system on the market. Firstly, our voice recognition software analyzes the student´s pronunciation, and automatically corrects and suggests how to improve it. Secondly, our tutors personally listen to the voice of the student in their free speech dialogues and provide suggestions, thus ensuring better evaluation of oral expression. Each unit has access to the grammar studied in each lesson and unlimited access to the grammar from revious courses with the aim of providing students with constant assistance. Students also have access to a manual that contains grammar content for the whole course. The reference book is available online and can also be printed. Dexway technology is accessible from virtually any mobile device on the market, with specific applications for Apple, Android and Windows 8.1 devices and through browsers designed for touch screens. Dexway students have the freedom to learn languages at anytime and anywhere, with automatic synchronization between devices. Also, students can download the course on their mobile device and access the course content without having an internet connection. One of our keys to success is to get students to talk, talk and talk. Dexway courses are complemented by conversation practice which allows the student to practise the language being studied with teachers and other learners in a high-quality virtual environment which includes audio, webcam, whiteboard and live chat. Dexway students can participate in conversation classes with native teachers throughout the course. In this way, students practice their oral expressions and give opinions on various topics and interests, specifically designed for their level. The students only need to enroll in one of the many conversation classes that are scheduled for their level, which are offered every day of the week. The classes can be in group or individual. Dexway students can speak with other students from around the world, in the language level they are studying, anytime they want and with no time limit. In addition, a native tutor can help guide them if needed. Students can meet freely in the virtual rooms to practise conversations at any time. Dexway prepares students to achieve the desired level and helps them visualize their progress through unit tests and final evaluations. Dexway courses prepare students so that they can perform the most recognized certification tests (Official Language School, ACLES, University of Cambridge, etc…). At the end of the Dexway course, our students receive a certificate of achievement for the completed course. One of the principal characteristics of the Dexway method is the human touch. Students feel supported at all times. Dexway students can connect with tutors at any time with just one click and talk to them live, face to face, to ask questions or resolve a doubt. No matter what time. If they desire, they can also contact them by email (in writing or by sending a recorded voice message), and receive an almost immediate response from one of the teachers. Dexway offers students the opportunity to do writing and speaking workshops personally corrected by tutors, who are responsible for evaluating exercises with individualized comments taking into account the progress of each student. 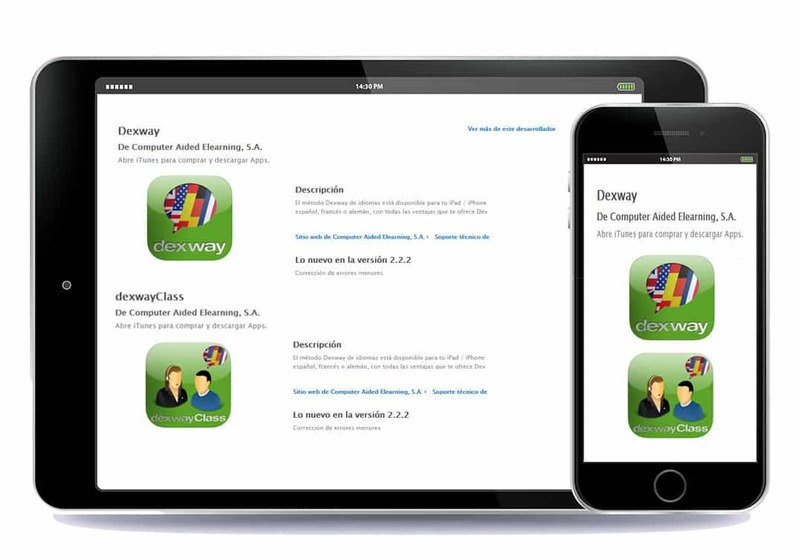 Dexway tools make a difference: personally track the performance of students and contact them periodically to help and motivate them to successfully complete their courses.